As reported in the Vancouver Sun, census figures for 2016 show 25,502 unoccupied or empty housing units in the City of Vancouver -15 per cent higher than recorded in the previous census of 2011. According to urban planner and Director of Simon Fraser University’s City Program, the bulk of the empty units were concentrated in Coal Harbour, Marine Gateway and Joyce-Collingwood. 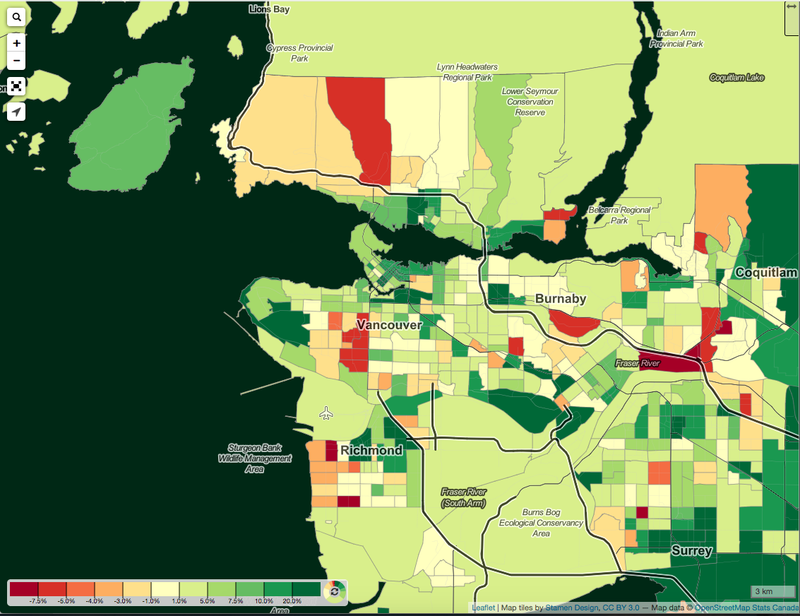 Following Vancouver were Surrey (11,195 homes), Burnaby (5,829) and Richmond (4,021). This map shows the relative population change between the 2011 and 2016 censuses in each area. Even within Census Metropolitan areas there are parts with population decline, as can be seen well e.g. in Vancouver …. Every year U-Haul International, Inc. presents “migration trends” reports, based on data collected from more than 21,000 locations in all 50 states and 10 provinces. City growth rankings are determined by the net of one-way U-Hauls arriving and departing in a calendar year. According to this information, Kamloops leads the country in growth -that is, it leads in net arrivals. The top-ranking British Columbia cities are, Chilliwack (9th), Vernon (15th), Penticton (18th) and Merritt (24th). As Gordon Clark underscores: 52.9 per cent of one-way U-Haul trucks leave Vancouver, compared to the 47.1 per cent that arrive. Wither Scamcouver? Plenty of scams to go around. I hope all is well. Too many scams, David -I’m drowning. I’ve had to pull back … for now. Miss your observations. No one writes like you. I wish I could have said that more snarkily. Thanks. I was drowning in my own snark and had to step away. A return is looking likely.